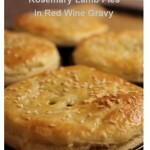 Leftovers from yesterdays roast lamb dinner get a makeover and is turned into yummy individual lamb pies with a red wine gravy. This is the first time I have managed to produce pies that look like authentic pies … very happy with self. Plus the flavour in these babies are out of this WORLD! 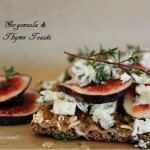 A beautiful, beautiful appetizer to have on a chilly autumn day. These toasts don’t just look good, but they taste incredible too! I like a full bodied blue, but if that’s not your thing then there are always milder, more tonned-down versions available. 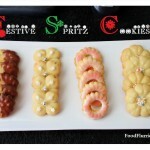 These look very elegant but without the hassle in the kitchen. I am sticking to my guns … my no-bake cheesecake guns that is. 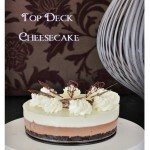 And today I share with you a wonderful double decker chocolate cheesecake recipe. I call it Top Deck coz the inspiration came from Cadbury’s Top Deck chocolate bar. 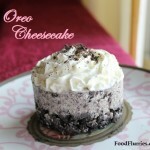 Todays no-bake cheesecake recipe was kinda made up in my head. 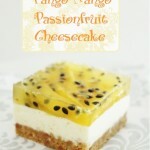 It’s a rather tropical variety … which is a bit weird given the time of year … but I had to get it out of my head and onto my blog, so here it is ~ Tango Mango Passionfruit Cheesecake. R loves passionfruit so this one is for him. Scrumptious! Scrumptious! 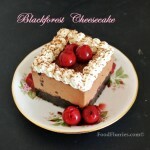 I don’t know about you, but I loooove everything about black forest … even this cheesecake version. There is no better marriage made in heaven than dark chocolate and cherries. When I stumbled upon this recipe I had to make it; and so should YOU for that matter. A classic flavour presented in a novel way. This is a lovely no-bake cheesecake I used to have when I was still a child. I have obviously upped the visual aspect of it by making it look fancy but it is otherwise a fairly easy homey recipe to put together. 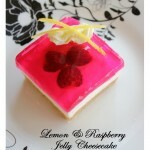 Wonderful flavour combination with a good fresh taste. 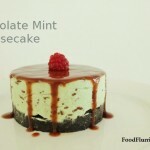 This week it’s been all about the no-bake cheesecake, and today I am presenting a chocolate mint variety. Took me a while to get the flavours right on this one. There comes a time when baking a dessert is all too much of a hassle. We’ve all been there. So today I have gone the no-bake cheesecake route … and what a treat it was too! This cake is FABULOUS and I strongly recommend it to everyone. Christmas is literally right round the corner, so this is me preparing early and testing out new recipes that I will replicate on a later date. These cookies are so delicious and with just one batch you can make up to fifty cookies. Serve them at home or pack them up and give them as gifts, either way they will be much appreciated.